When I was a callow youth, my dad subscribed to a magazine called World Sports. This wonderfully produced monthly offered a means to satiate the absolute mania for information and statistics on my three obsessions at that time, football, cricket and track and field athletics. I recall being transfixed reading of the first ever 18-foot pole vault, by a Greek gentleman by the name of Cristos Papanikolau, in 1970. I literally couldn't wait to get my hands on this treasure trove of sports writing each month. As time went on and I started to generate my own income (paper round) I began to specialise, my then part-time occupation allowing me discounted (not necessarily of the five-finger kind) access to Shoot, The Cricketer and Athletics Weekly, which coincided with the end of my dad's subscription to World Sports. What I wasn't aware of at that time was that World Sports had already been available for quite some time, so it was with great delight recently that I found on eBay a number of back issues for sale. As a result of that procurement, I would like to present in a series of articles a review of some of the great cricket pieces which this gem of a magazine offered its readers. Writers of the calibre of Denzil Batchelor, Bruce Lockhart, SC Griffith and the great man himself, Neville Cardus, delighted those of the cricketing faith who were fortunate enough to get their hands on this monthly sports review. There were many other items of interest, such as features on women's sport like "How far should women run? ", plus stop-frame coaching pieces featuring Lindsey Hasset's batting and Jack Iverson's bowling, as well as a regular cartoon feature with much ancient wisdom from, among others, Fuller Pilch, William Lambert and James Lilywhite. The oldest edition currently in my possession is from April 1948. This edition opens with a piece by Denzil Batchelor which features the great all-rounder Harold George Owen "Tuppy" Owen-Smith, whose nickname was shortened from the original "Tuppence" and who was capped for his native South Africa at both cricket and rugby. In cricket, he played in just a single five-Test series but his legend was cemented by an innings at Leeds in the third Test – described in the following year's Wisden as “distinctly the most exhilarating member of the last South Africa team to visit this country”, his 129 was enough to help South Africa progress from 172/9 to 275 all out, though this was not enough to prevent England winning by five wickets. Smith was also a useful welterweight boxer, and after his sporting days were done he became a doctor in Cape Town. In the main cricket piece featured in this edition, Cardus (bylined as “the famous cricket writer and music critic”) was considering that year’s Olympic summer, as well as the upcoming visit of the Australian cricket team, in his piece entitled “Have we lost the fighting spirit?”. The maestro gives us an insight into his character with this opening, which could have been written by our own Martin Chandler – Once or twice, in my young, hot-blooded days, I have hated Yorkshiremen when they have been beating Lancashire, but on the whole, the result of a match seldom remains in my memory…. Not that he takes to sport in a lukewarm or neutral fashion, as he goes on to explain – even an exciting finish appeals to me dramatically – for its own sake, for the stimulation to nerve and imagination that an exciting finish gives us, apart from the question of who wins and who loses Truly a lover of cricket for its own sake, though he goes on to caution I want my cricket hot with Yorkshire relish…I want all the rigour of the game, with no laggards and no bowing-or-scraping, or a cheery ‘Well tried” to some fool who has missed a tolerably easy chance-at very deep long on. As Yorkshire’s Roy Kilner opined What’s use of oompires in Yorksheer and Lankysheer match? They never ‘ears owt. What we want in Yorksheer and Lankysheer matches is no oompires-and fair cheatin’ all round. Indeed. Discussing the previous summer and its restoring to health of both cricket and a war-weary nation, Cardus notes Cricket has indeed been unctuous about its powers towards “moral improvement”. We want no more of that. In this Olympic year, and having seen in the previous year the cricket crowds being restored to health by the feats of Compton and others, Cardus appealed to nothing more romantic than man’s love of losing himself in enjoyment-thereby finding himself and the one and true god of sport. 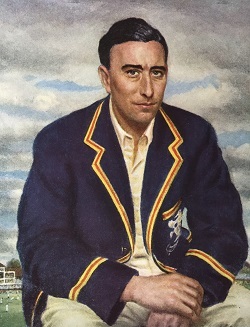 The following month’s edition, May 1948, includes a colour plate featuring a painting of 1947 Sportsman of the Year Denis Compton, though with no indication of the identity of the artist (see above). There is also a fine representation of Ray Lindwall’s action in stop-frame sequence. The main cricket piece is once again penned by Neville Cardus, as he previewed the visit of what would come to be known as Bradman’s Invincibles – After ten years we are about to see Australian cricketers again in England, and for a while we’ll be able to watch a real Test match, every ball a nail in someone’s coffin. Already our pessimists, hereditary lords of compliant and woe and dyspepsia, are lengthening their fine faces in dire presage of England’s defeat. As Cardus noted There is certainly something to be said for the point of view that England will not beat Australia this year until they have got Bradman out tem times. Though England did manage to dismiss him seven times, Bradman averaged “only” 72.57 though, in what was his last series, he was only outscored by Arthur Morris. Indeed, the scene for the series was set in the first Test, when England found herself behind by a massive 344 runs on first innings. But before this all played out, Cardus was wishing for a wet summer – Bradman has yet to show us sustained mastery on a sticky pitch against a fast bowler, going on to explain how the exploiters of stickies had shifted to the faster end of the bowling spectrum. However, Cardus still feared Bradman was as near to the ball as the sheath to the encased sword…To get him out ten times will come close to the general beggary of wit, invention and resource. He bemoaned the bowling on both sides as mediocre – There is no O’Reilly, no Grimmett…none of them-neither Lindwall, nor Miller, nor Toshack, nor Ring, nor McCool-are in possession of tricks and devices not familiar to any cricketer pretending towards first-class. However, despite the great man’s prognostications, as Wisden noted in 1949, Lindwall’s bowling proved the biggest sngle weapon on either side. Cardus opined that Compton would be England’s hero, and indeed Compton’s 184 in the first Test seemed to bear that out, and he would go on to average more than 60 in the Tests. However Cardus saw the skipper, Hutton, as England’s mainstay with the bat – our nearest to the Jack Hobbs model.. The great writer also foresaw Doug Wright as possibly England’s trump card, however as it turned out lumbago forced the spinner’s withdrawal from the first Test and an uninspiring 2/123 in the second meant he was not called upon again. Cardus concluded In any case, there is no room in the present age, with its shadows and uncertainties, for dull, unentertaining sport. Dreary cricket will today be regarded as a waste of time, manpower, money and temper. Hopefully, despite England’s defeat and the inaccuracies of some of his predictions, the great man was able to lose himself in his enjoyment of cricket, rather than the result.